Minecraft players explore their world. 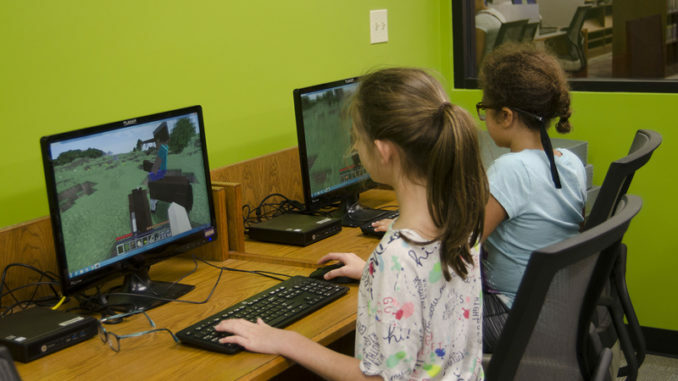 Minecraft takes place every Tuesday from 5:30 p.m. to 6:30 p.m. at the West Regional Library, 105 Lakewood Dr. in Luling. It is for ages 6 to 11. There are only 15 spots available, so registration is required through the library’s online event calendar at www.myscpl.org. Minecraft is a computer game where players create a world out of blocks. Players are able to create, explore, and craft in a virtual world. Library staff member Angela Hicks began hosting the Minecraft programming beginning in September 2017 as a twice monthly program. It quickly became popular with the attendees, and the within a few months the program became a weekly addition to the library’s schedule. For more information, contact Angela Hicks at the West Regional Library at angela.hicks@myscpl.org or (985) 785-8471. Nerd Night takes place every Wednesday from 5:30 p.m. to 7:30 p.m. at the West Regional Library, 105 Lakewood Dr. in Luling. 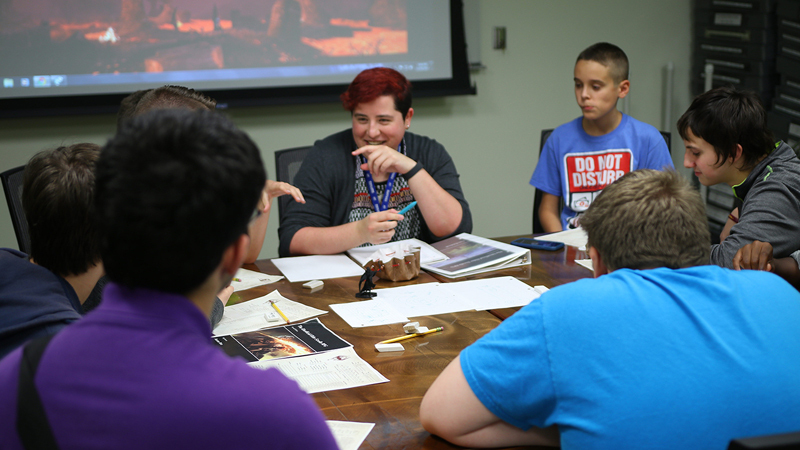 Library staff member Kari Duet leads a group of teenagers as they celebrate their favorite fandoms, make new friends, and play games. Nerd Night has been a great success since the West Regional Library reopened last year after an extensive renovation. Opics vary from week to week, and new participants are always welcome. For more information, contact Kari Duet at the West Regional Library at kari.duet@myscpl.org or (985) 785-8471.